The following communications were sent to us via email prior to Yom Kippur. After consultation with Gedolim (leading authorities), we postponed publication until after the holidays, along with our reply. On the advice of my legal counsel I wanted to put you on notice that I will pursue every legal venue available if you continue to publish Avrohom Gordimer’s libelous and unfounded accusations against me. In his recent essay he accused me of wanting to “completely revamp” the suddur when I explicitly said in the referenced essay that I’m merely suggesting to use art work to compliment and enhance our prayer experience. It’s about time I stand up for my reputation and kavod of my family. I will pursue any legal venue against your website and those of you who are behind it. That’s what I owe my wife, kids, family, students and community. 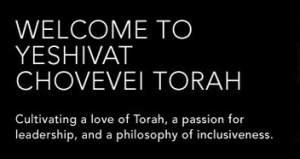 Yeshivat Chovevei Torah Rabbinical School; Director of the Lindenbaum Center for Halakhic Studies; Educational Director of Judaic Studies, Luria Academy, Brooklyn, NY. ; Rabbi, Prospect Heights Shul. We at Yeshivat Chovevei Torah stand behind Rav Ysoscher Katz whom we respect and admire deeply. Any attack on him is an attack on all of us. The following post, which may still be viewed on Facebook, is also germane and is mentioned in our reply. It addresses a recent article by Rabbi Gordimer, and reading it helps to place both the communications received and our reply in context. While only a few of the Cross-Currents writers have discussed Open Orthodoxy, we all share a Jewish tradition of open debate, argument, and even refutation. We previously believed that you do as well, and thus your communication to us comes as a disappointment. The Talmud does not hesitate to say tiyuvta d’Rava tiyuvta — the opinion of Rava is conclusively disproven. Even a sage at the level of Rava suffered the rejection of his ideas after critical examination; that is how it is supposed to be. Those who express an opinion in Jewish thought (and, indeed, in the secular world as well) enjoy no protection from being told — correctly or otherwise — that they are wrong. None of us believe personal attacks are appropriate. Despite your assertion that you were attacked personally, in none of your chosen examples were you even quoted by name. It is the ideology of Open Orthodoxy and YCT, as expressed in your articles and those of your colleagues, that we, among many others, have criticized. In regard to your claim that AG distorted your intent about revising the siddur, here is what you wrote: “Tefilot have a very short shelf life. After a while they become outdated, losing their power to inspire… Revamping the entire liturgy is a rather ambitious project which could eventually happen but for now one needs to start small, doing it incrementally and let it expand with time.” Readers may decide if Rabbi Gordimer was faithful to your words’ intent, or not. Given that the Chairman of your Board of Directors is a well-qualified attorney (to whom you cc’d your letter), it is certain that you were already informed that a libel suit would require proof of deliberate slander, and that you would not find that on our website. Thus your letter seems intended simply to protect your opinions and articles from criticism. But in that, your letter is contradicted by your opinion as expressed elsewhere. We are unsure how to square your message to us with a Facebook post that you published within 48 hours after you sent the letter. There you wrote — commendably so — that you favor open debate and hope that Rabbi Gordimer in particular continues to write. But if you honestly appreciate the discussion, why would you send this letter? It seems inconsistent to us. We also fear that this unusual behavior is not particularly new. Members of the YCT administration and their supporters have previously asked important acquaintances of Cross-Currents contributors to use their influence in order to mute criticism of the YCT claim to Orthodox legitimacy. This happened while those same individuals were writing publicly that they cherished the public debate! You, Reb Ysoscher, are merely the first to put both antipodal sides in writing. This is what overrode any initial reluctance to publish your letter. Any individual, especially feeling beleaguered, can react rashly and irrationally. But when the President of YCT stood behind your words and your threat, and after a history of trying to silence Cross-Currents writers, this appears to be a pattern important enough to share with the public. What we observe is an “Open Orthodoxy” trying to avoid a pushback that it certainly could and should have expected. It is attempting to make its changes a fait accompli within the greater world of Orthodoxy before meeting compelling rejection from within both Modern Orthodoxy and the charedi community. Open Orthodoxy is trying to obstruct open debate of its philosophy and goals, and is even trying to hide that it is doing so. Open Orthodoxy has not merely misled the public about being Orthodox — it has dissembled about being open, as well. That seems compellingly germane to the ongoing discussion of the Open Orthodox agenda. Sunshine is the best disinfectant. Yasher koach to CC and to R. Gordimer, for being intellectually honest, passionate about Toras Hashem and not accepting’s the OO/NC movement, disturbing tactics. Hopefully Reb Ysoscer will change course and we will accept him back to the Torah community, as the brother that he is. I hope he doesn’t exert himself too much chasing after all of those courthouses. I mean, it shouldn’t take too much effort to pursue a legal venue, but, then again, I don’t know why one would want to pursue the venue and not the avenue in the first place. please just be sure you maintain the same standards for publishing comments critical of C-C contributors. 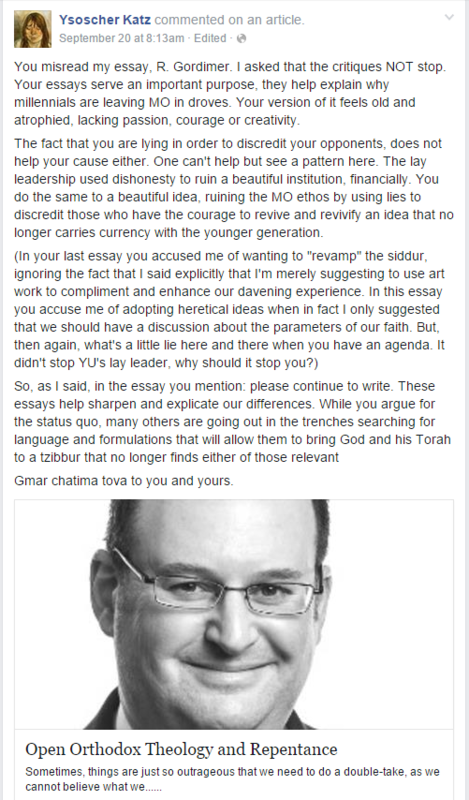 I also would ask that you open Rabbi Shafran’s posts for comments in light of this admirable vision. I share much of your view on OO but more so the need for honest, open discussion. I tend to agree with Joel Rich-on substance I tend to agree with much of the criticisms of OO. The major disagreement that I have with some of the critics of OO that some tend to use ad hominem attacks and sometimes maintain that the supporters of OO are not even a bar hachi to take positions. IMO the critics of OO would be much better off responding to the halachik positions claimed by OO on a halachik basis. Once one includes metahalachik ideas in the argument it becomes a matter of trusting my metahalachik ideas rather than your metahalachik ideas. Personally I would tend to follow in general the metahalachik ideas of the critics of OO rather than those of OO leaders but that is my preference not an argument. Just commenting on the legal aspect threatened here, it is all hot air. Anyone can sue, but they have no case. Aside from the reasons mentioned in CC’s response, the problem they will face with any potential lawsuit they file is that it is based deeply on determining religious theology and where ideas discussed by the plaintiff fall on the religious spectrum. This is an answer no American court will touch and, by legal precedent based on Constitutional separations, will decline to hear the case in the first place. Paragraph 1 of the notice specifically states that “Mr. Klagsbrun has never given a Jewish divorce to his wife Shulamith Klagsbrun.” Paragraph 2 further claims that “Mr. Klagsbrun has since remarried, claiming that he has the necessary permission from a rabbinical court to do so.” The plaintiffs claim that these two provisions, in concert, charge Seymour Klagsbrun with bigamy. To make out their claim, the plaintiffs must prove, inter alia, that the statements made by the defendants concerning his alleged bigamy were in fact false. To determine whether the statements were false, however, this court would be required to inquire into areas of clear ecclesiastical concern. There is no dispute between the parties that the Klagsbruns received a civil divorce in May, 1995. The statement concerning Seymour Klagsbrun’s alleged bigamy, therefore, was plainly made in the context of the Orthodox Jewish faith. Consequently, to ascertain whether the statements were defamatory, this court must ask whether Seymour Klagsbrun was in fact engaged in bigamy within the meaning of the Orthodox Jewish faith. For example, this court would need to inquire into the nature of a get, how and under what circumstances it may or may not be given, and who has the authority to grant a get. In addition, this court would also be called upon to inquire into the nature and propriety of any special dispensation concerning a person’s right to remarry without first giving a get to his wife. Determining whether the special dispensation Seymour Klagsbrun allegedly received permitting him to remarry was valid and proper would clearly involve this court in questions of religious doctrine. This court finds that an inquiry into the truth or falsity of the defendants’ statement concerning Seymour Klagsbrun’s alleged bigamy would entail judicial intrusion into ecclesiastical doctrine and practice, which is unquestionably forbidden ground under the First Amendment. Hard to see how a suit over whether Ysocher Katz committed “blasphemy” could possibly be decided under secular American law. I’m not sure that any interpretation of religious doctrine would be necessary in determining whether false information was knowingly disseminated with the intent of causing emotional distress. It depends on what the alleged libel is. If someone sues because he was called a heretic, then, yes, you have to interpret religious doctrine. Just stumbled across a very recent decision of a NY Appellate court. STORFER v. STORFER, 2015 NY Slip Op 6966 – NY: Appellate Div., 1st Dept. 2015. The motion court properly found, however, that it could not determine the meaning and intention of the parties’ agreement to raise their child in “accordance with the tenets of the Modern Orthodox Jewish faith.” The trial court correctly determined that this cannot be decided by neutral principles of law or without reference to religious doctrine and was thus prohibited from entertaining the defendant father’s enforcement application. The comments of the YCT faculty members and leadership represent an alarming attempt to chill and neutralize discussion on the various actions of YCT faculty members and their hashkafic POV that should be rejected by by anyone interested in discussing the future of MO. Casting a serious hashkafic disagreement and analysis into a personal dispute is what one does when one wants to avoid serious discussion. What YCT wants and is demanding is a default in its favor without room for a dissenting POV. It is what is called a trigger alert on college campuses and should be rejected wholeheartedly and fearlessly by the editors. I would urge them to stand by R Gordimer whose articles have exposed where, when and how YCT’s actions and hashkafa are simply beyond the pale of a normative Orthodox POV. The real issue here is that YCT views any analysis and/or dissent as a form of microagression, a pernicious way of stopping expression of and exposure to of dissenting views that is intellectually au courant in many of America’s universities. I call upon the leaders and writers of Cross-Currents to resist this attempt at intellectual McCarthyism and adoption by default of the POV of the persecuted dissenter . The attempt to recast a serious discussion into a personal assault should be resisted by anyone who has read R Gordimer’s essays and others herein that have shown how, where, how and why the views advocated by YCT, its leaders and supporters cannot be reconciled with a normative Orthodox POV. Stated otherwise, wondering about what a YCT affiliated person thinks when he or she recites a Birkas HaMitzvah is a legitimate source of concern, that should never be viewed as an illegitimate point of contention and/or inquiry. What marvelous irony. “Open” Orthodoxy threatens legal action to “shut” opposition to its agenda. Of course, if the roles were reversed R. Katz would highlight this action as absolute proof of chareidi intolerance. Don’t forget “every legal venue.” He uses that twice. I am wondering if the Reform, Conservative, etc., movements in the past similarly threatened Orthodox leaders who criticized them with legal action? I know that Orthodox rabbinic leaders had strong words for the Heterodox leaders and what they represented. Maybe some of them spoke in Yiddish in the old days, but there were people like Rabbi David B. Hollander z”l, who spoke and wrote very strongly in English as well. He appeared many times in electronic media as well, mostly on radio. He refused to call them Rabbis, calling them instead ministers, spiritual leaders, or spiritual misleaders. I wonder if he ever received such threats. It would be ironic if OO is doing here what Reform and Conservative (perhaps) did not do. Note of course the entirely different approach of the Rav ZT”L who in English correspondence would refer to them as “Rabbi” I think it is fair to say that the approach of the Rav was to treat them in general as mistaken rather than evil. I believe it is a much more effective approach. Of course-if one is merely preaching to the choir and wants to rile up their base treating people you believe are wrong as misleaders will be effective. Maybe not the Reformers, but much earlier, the early Jewish Xtians and other heretics would inform on Rabbis to the secular authorities, it’s why Birkas Minim, which curses heretics that inform on Jews to the authorities, the only change in the Shemoneh Esrai since it was written, took place. Perhaps Birkas Minim is also on the list of things in the Siddur that need reforming by Open Orthodoxy, on that note…. it would explain much. How about a counter suit accusing OO of violating “truth in advertising.” Shouldn’t be viewed less seriously than one accusing Cross Currents and R. Gordimer of “libelous and unfounded accusations against [him].”. This is low, very low. And Katz has now succeeded in alienating those who would otherwise have been sympathetic to him. I include myself in that group. While thoroughly disagreeing with his view on life, I thought Gordimer should just drop the subject already and live and let live. But now a line has been crossed. Such a classless threat reveals an ugliness to his group that takes it beyond merely misguided, and into a far worse realm. I encourage rabbi Gordimer to feel not even the SLIGHTEST bit of a chilling effect. Not one little iota. To allow that would be to grant a victory to Katz. A lawsuit like this would be dismissed on the pleadings alone, it would not take long. Any lawyer who filed it could be subject to sanctions, so patently frivolous and unconstitutional is the claim. This is the emptiest of empty threats, and must be completely and totally disregarded. Would add: in a way, it’s a shame this threatened case will never be filed, and would get immediately dismissed if somehow incredibly it would. Because the truth is a defense in libel actions. And one can use the discovery process to get at the truth, including electronic discovery of all Rabbi Katz’s emails. Can you imagine what that would reveal? No, no such sanctionable lawsuit will ever be filed, but it would be the absolute death knell for open orthodoxy if if were. Or as Rav Hutner z’tl is reported to have said when, at a wedding, he was served decaffinated coffe, with Rich’s pareve creamer and sweet n’ low: The coffe isn’t coffee, the milk isn’t milk and sugar isn’t sugar. I was never a fan of YCT, but I also never imagined they would stoop to this. At the very moment that Katz was accusing Rabbi Gordimer of “lying,” he himself was lying about how he felt about the criticism. And so he resorted to a cheap and low threat. It’s completely indefensible. You did absolutely the right thing publishing that cheap threat and letting everyone see and judge for themselves. And since both Katz and Lopatin participated — what does that say about a person who remains a part of Open Orthodoxy, now that we all know what it’s really about? Even rats know when a ship is sinking. This is nothing but threatened “lawfare”, a tactic used by Muslim groups to silence criticism of their religion and its more violent practitioners. It is the same tactic used on campus to silence pro-Israel advocates and speakers, right wing student groups and causes with which they stand such as pro-life groups. It is the same tactic presently being used by global warming/climate change/tomorrow’s substitute terminology alarmists to silence those who would dare bring proof that their “settled science” is fraudulent hogwash (see M. Mann v. National Review, M.Steyn et al). This is actually a welcome development as it shows OO’s true leftist colors and inability to carry the debate any further. CC and its writers have done well to not allow OO to mainstream their views with impunity. Keep up the milchamta shel Torah! Why don’t the various frum leaders simply get together and declare that Open Orthodoxy is a different “denomination” of Judaism, like Reform or Conservative? Don’t recognize their semicha, hechsherim, or stam and simply ignore any dialog with them like we’ve been doing to the others for decades? because they are not. anyone remotely familiar with the diversity of opinion that has been constant in traditional judaism, would not offer such suggestions. the idea of a uniform daas torah is a much more novel/modern invention than anything YCT has promulgated. I think they are a different denomination. I would not, sadly, marry their geirim, eat from their hechsherim, etc. Dr. Bill, you like to obfuscate issues and minimize them, as you have done here. The core issue is the lack of intellectual honesty they bring to halacha, which makes everything they do suspect. I define the orthodox tent by observance of Shabbat, taharat hamishpakha, Kashrut and other fundamental mitzvot. I don’t exclude Satmar despite their anti-zionism or YCT because of its pro-feminism. If an unbiased observer watched CO, MO and OO Jews, an attempt to label them fundamentally different would fail. It would make more sense to respond like a few chareidi gedolim, who exclude all those with a kippah serugah as well. read the original article, particularly the opening paragraph. Unlike what you, the cross-currents writers or Rabbi Gordimer believe, what he meant is obvious when read in context. Revamp does NOT mean rewrite. Adding pictures to books to illustrate ideas, may be radical or even a bad idea. But if you, as it appears others also believe, that he wants to tamper with key elements of the tefillah, then i understand your perspective and suggest a remedial course in reading comprehension. As an aside, a good history on the evolution of our tefillot might give you some needed perspective or maybe Moshe was actually wearing a shtreimel while davening from an Artscroll. And in my shul with a wonderful charedi Rabbi, a graduate of Lakewood, (and a close friend) some of the tefillot in Artscroll “have a short shelf life.” We skip them. Again, you hide behind vague statements – which tefilos are you skipping? Yishtabach? Hallelu avdei Hashem? Ahava rabbah? Yekum purkan? U’nesanah tokef? Are you sure what you’re skipping is because you’re smarter than Dovid, the Anshei Knesses haGedolah, the Gaonim and the Rishonim? Webster says revamp is: to remake, revise, renovate, reconstruct. Given Katz’s background, I don’t think he means a fresh modern English translation and a picture of a Chagall window. Sigh,,,still with the shtreimels? And still with the patronizing and condescending assumptions and snark, the tired Artscroll stuff…Dr. Bill, everyone here is as smart as you are. Everyone here knows that people who invoke “daas Torah” are often far removed from it, and that tefilla has evolved over the centuries. Your shopworn idea of readers of CC as neanderthalian primitives reveals much about you, and is demeaning and insulting. Ysoscher Katz is a nice man with some very confused ideas, of which the short shelf life of teffilot is just one. We’re all happy to let him and the YCT folk go their own way – but we have to let people know just how strange and outlandish their ideas are. chaim7356, when you write “Dr. Bill, everyone here is as smart as you are.” I wonder how you might know? On those (rare 🙂 ) occasions, when in the presence of one who is brighter/more original/more analytic than me, I will be the first to acknowledge and take full advantage of what i might learn. This is not the venue where I find many such people. BTW, my guess is, my reading of Rabbi Katz’s article, is now much better understood, given some of the most recent comments. As Ronald Reagan once said, “there you go again”. I said that everyone here is as smart – not smarter – than you. How do YOU know otherwise? And I will say for the record – I’ve been reading your comments for a long time, and I have learned nothing – nothing – from them. Your references to advances in academic Talmudic studies, to women’s study in Israel, contain nothing new or of substance. I – and many others here – are well aware of, and keep abreast of, developments in Israel as elsewhere. You are not in possession of any special knowledge, but you behave as though you were, and continue to make inappropriate and inaccurate assumptions about others. I wish you well, and will respond no further. Maybe you can enlighten us which poskim you feel are relying on non-halakhic arguments? I’ve been looking through R’ Chaim Ozer, R’ Moshe, R’ Shternbuch and R’ Wosner … I just keep finding lomdus. While you’re at it, you can also list gedolim who have decided that a kippah srugah is pasul. Your problem is you’re looking at practice, when you should be looking at deyos. It’s true, at the moment OO adherents are within the (externally visible) lines. But if they agree with Zev Farber et al. about the mutability of Torah shebksav they are apikorsim whether you hold like the Rambam or the Ikkarim. Ari, Seriously, you need my help? In olden times, such occurrences were more rare and rabbinic literature has code words to signal such an argument. If you read Prof. Katz and his students books/articles, particularly of the 19th century and later, you will be better equipped to spot a non-halakhic argument. It is hardly trivial, especially when poskim do not identify such thinking and any of numerous examples would only cause further debate. Ari and Ben, I will not get into an argument about Rambam’s ikkarim. Opposition to them by rishonim/achronim and their originality in rabbinic history, though indisputable, are not all that relevant given their almost universal acceptance for the last hundreds of years. The issue usually comes down to beliefs about the Bible; a rational discussion requires that each part of the central beliefs be unpacked and the challenges be understood and addressed. That requires a book and a course, not a blog post and comment. I do however believe that behaviors not beliefs better define the current orthodox tent. I have often repeated what a wise man once told me – judgement on where to concentrate your energies is the most important decision you make. Focus on what matters and solutions will eventually be developed. But working on what does not matter, is always a losing proposition. YCT is addressing issues relating primarily to feminism and the halakhic process. Good areas on which to concentrate, but to date YCT has had limited, inconsequential results. Rabbi Gordimer is focused, though not exclusively, on YCT. Bad judgement on where to focus; more fundamental developments are happening elsewhere. YCT and Rabbi Weiss’s efforts around feminism are not where all change is centered; feminism is playing a more important role in a number of OU shuls with RCA rabbis and in yet different ways in Israel. Try attacking all those who attended a ceremony that included women’s ordination in Israel. Interestingly, despite a host of opponents to ordaining women, I have not seen a single negative comment on one of Rabbi Riskin’s two rabbinic graduates. Changing halakhic responses to feminism are happening, albeit slowly as in all areas where there is halakhic adaptation. I would expect thoughtful essays on how Cross-Currents authors views a plethora of these (non- YCT) activities. Similarly, I found Rabbi Katz’s comments on the halakhic process hardly precise, and worded to invoke provocation not progress. However, in just the last three months I have read multiple books, all (but one) by observant Jews, that address various topics in the development of halakha over the last 2000 years. Rather than attacking a short article or a blog post, it is more critical for Cross-Currents authors to deal with these more important efforts. They may not make headlines, but will undoubtedly have long term influence. Frankly, I found Rabbi Katz’s threats of a lawsuit as a pathetic reaction to Rabbi Gordimer’s focus on the inconsequential. But this tiff does provide the opportunity for bittul torah, leshem Shamayim. Or as the Rav ztl, who Rabbi Gordimer likes to quote, said in a (slightly) different context – er battilt, vi a rosh yeshivah. Rabbi Lopatin agrees with Cross-Currents: Rabbi Gordimer’s attacks were an attack on all of YCT, not R. Katz personally. You can take the man out of Satmar, but its more difficult to take Satmar out of the man. In the secular world, the Political Left has a habit of labeling anything expressed to the political Right of it, to be Hate Speech that must therefore be censored. It sounds to me that this is what is happening here as well, except this time, it is in the religious sphere. The Left in this case is, of course, those advocating Open Orthodoxy, and it is they who are calling for the censorship of views that are more to the Religious Right than they are. This attempt to forcefully shut down dialogue, tells me that the Open Orthodox are incapable of winning their arguments in open forums such as Cross-Currents. We do, however, live in what is presumably a free country, and not in a totalitarian one, and therefore there is no reason to curtail our right to express our views, even when some people find them to be offensive. Yishar Koach Cross currents and Avraham Gordimer for the resolution to fight this till the end. R. Katz’s email is both wrongheaded and absurd, and R. Gordimer should continue to publish his opinions as he sees fit. And it made some sense to post this in public, in order to shame those who attempt to stifle debate through bullying tactics. However, I don’t see how this actually provides evidence for the truth of one side over the other. Furthermore, attempts win arguments by labeling a movement as “Conservative” (meaning heretical) are similarly useless, IMO. I think a link to Rabbi Katz’s original Times of Israel article, who let readers decide whether his blog post or CC’s letter above more accurately reflects his view. Dr. bill – your comments on this post fully disclose that you are an apologist for OO, if not very sympathetic. I mean you gloss over the entire issue of their letter and the Facebook post. Its almost like in your mind this never happened. Most people commenting here have read the original TOI opinion piece and this CC post, and their conclusions, as evidenced below, put you in a very small minority. But hey, keep it your campaign of solidarity. Looks good on you. Rafael Hamburger,I am hardly an apologist. i have referred to their writings as unnecessarily provocative and Rabbi Katz’s letter as childish. That said, Rabbi Gordimer’s attacks are often exaggerated and misdirected. The above post by Rabbi Katz is harsh, but understandable; when read in conjunction with TOI article, it makes the CC response a real tiyuvta. As i have said often, in Israel much more significant change is occurring in any number of places that no one in their right mind would attempt to exclude (most of it) from the orthodox tent. Both the chareidi and DL/MO communities are very different than their US cousins. In fact, some/many masorati elements in Israel, are heirs of the late Prof. Lieberman and his students in Israel, (most already in the olam haemes), versus the US conservative movement. Robert Lebovits, Rabbi Katz does not oppose tolerance and responds very differently when he feels he was not grossly mis-characterized. I did not like his response to Prof. Berger, but he did not attempt to silence him. His exchange with Rav Glickman was exemplary. As mentioned above, Rabbi Katz’s father passed away yesterday. Despite my critical remarks, I respect his efforts to bring positive change to the traditional Jewish community. Both propositions are not quite accurate. As your comments yesterday make clear, you are referring to Rabbi Riskin’s and another guy whose name I forgot attempt to ordain women rabbis. These are entirely insignificant. The reason the OO group has drawn ire is because their goal is to create what its critics say amounts to a new form of conservatism. By contrast, what Rabbi Riskin and the other individual did is pretty much the same as some of the individualized stunts Rabbi Avi Weiss is constantly trying to pull – call it gadflyism. At any rate, it is not true that significant change is occurring in Israel, and it is not true that – should such change ever happen – they would not be excluded from the orthodox tent. They most assuredly would be. DF, I was NOT referring to Rabbi Riskin or the other Rabbi whose name you forget, but to two rabbis who have RAL ztl’s imprimatur. What is happening in Israel is significantly more consequential; the seforim/books/journals being published are extensive, compared the trickle YCT produces. In Israel the likes of Rabbi Gordimer are more likely in the chareidi camp who have their own issues on which to concentrate. In Israel, there are dozens of rabbis/scholars/professors who are comparable and to left of the average YU RY, and you can visit almost a half dozen quality institutions, where talmud and halakha are being studied, that are closer to YCT than YU. Doctor, it’s a little hard for me follow you. I thought, based on your previous comment, that you were referring to ordaining women, and it is to that notion I stated that the notion is no further along in Israel than it is in America (that is to say, non-existent.) But If you are referring to academic approaches to learning, as opposed to “yeshivish” approaches, then certainly I agree. Academic approaches are very wide-spread in Israel, and quite common in many of the “white” yeshivas. In general I think this is a positive development. But here too, it seems, as in all matters generally, the YCT approach takes a good idea and runs too far with it. They have not shown the wisdom or maturity of being able to use the good in an idea, and leave the bad. Or to use the traditional phrase – eat the kernel and discard the chaff. I would add one word of caution, too. Men are very quick to describe something as “growing” or “increasing.” A few years ago, after Ruth Calderon read some aggadah in the Knesset, we heard breathless predictions of a “Talmud revolution” in the streets of Israel. Well, none of that has come to pass. Fads are fads, and even in their time are only applicable to small amount of people. Jews of all stripes ought to be circumspect in their predictions. I enjoy your comments and respect your opinion. Good Shabbos, Shabbat Shalom. DF, Thank you for your kind comments and perceptive remarks. As you noted, YCT would be well advised to become more circumspect and constructive, losing their penchant for being (unnecessarily) provocative. They (some more than others) seem to enjoy their “bad boy” image. I am purposefully opaque on a number of topics for two reasons. Wrt feminist issues, I am not as focused on those in the forefront like Rabbis Weiss and Riskin who are IMHO directionally correct but in overdrive, as I am on more prominent leaders whose opinions I value personally. Since their names do not normally appear on CC, I don’t want to drag them into the arena. Wrt academic studies, I certainly do not want to get into a debate in so complex an area that naming book, articles or authors would invite. I agree with your sense that the impact is hardly felt, yet. The Brisker conceptual method, which is by an order of magnitude easier to teach/adopt, took two to three generations to become widespread. Academic Talmud, that has finally broken its association with non-orthodox movements, will take yet longer. As well, it has attracted considerable (occasionally virulent) opposition in some chareidi quarters. Brisk had opponents but not remotely comparable. Additionally, a really good chidush in academic Talmud takes considerably more work, and that makes it a lot less attractive especially to a generation wanting more immediate and frequent gratification. Are we better off if they go more undercover but still operate outside halacha? This needs far more than a PR adjustment. And not all trends in Jewish thought are for the sake of Heaven, whether they gain adherents or not. Does R. Katz repudiate the letter he sent to Cross Currents? If he does not, then whatever interpretation one wishes to make regarding his comments about tefilos is really irrelevant. His attempt to squelch criticism via coercion speaks directly to the hypocrisy of his demand for tolerance for non-traditional ideas and condemnation of charedi/yeshivish leadership for their supposed rejectionism. R’ Ysoscher Katz’s father was niftar yesterday. Bd”e. My thoughts are with him and his family at this time of pain, irrespective of theological differences. May hashem give him the strength needed for these trying times. The phrase “Revamping the entire liturgy” needs to taken in context. He was talking with respect to his idea of adding visual props to the davening. i.e. start with by adding art to selichot and then add to the rest of the siddur. Addng art maybe a bit weird (definitely not to my taste), but don’t think its the end of the world. So this has been misinterpreted (most likely in error) by R. Gordimer to mean changing the actual davening. Where does Gordimer say in his response that he is talking about the actual text? Am quoting cross current’s reply. 3rd paragraph. In fairness to him and to Dr. Bill, all he is suggesting is adding pictures. Really. His opening line (“Tefilot have a very short shelf life. After a while they become outdated, losing their power to inspire”) is outrageous. But his suggested antidote is pedestrian. I am relieved to hear that he is only referring to pictures. Personally, I love the Nevarech benscher that made the bar mitzvah circuit 13 years ago. Some of the translations are funky but the pictures can move me to tears. And some years ago I went to an audio visual presentation by Rabbi Maimon Elbaz on Shemoneh Esrei, parts of which I still reference in my davening. But frankly, in day to day use, I think that studying tefilla, and maybe personalizing one’s siddur with side notes and even pictures, etc. will do more to improve and revitalize one’s tefilla. I cannot access your link now but it sounds gimmicky. And we also have to remember that we can’t expect every day to be “on” – it’s normal to have ups and downs (the yemei ahava and yemei sina) – and during those times we can just say, let me feel the truth of the words and the meanings I’ve learned. I agree. As I noted(somewhere) below, our shul and most I have been in, omit various piyutim; referring to that as a “very short shelf life” gives new meaning to the term “very short.” As often occurs, his language is unnecessarily/purposefully provocative. I assume it pleases his natural supporters and provides his opponents an opportunity to attack. They want to clear away opposition by shutting it up, so they can put out new lies unhindered. The modern way! Seriously, as silly as the threat of a lawsuit is, he attacked what is now clear to have been based on a rather questionable reading. If anything these attacks are having the opposite effect – more attention. I for one am not impressed with what YCT has accomplished, and particularly some of their choice of issues, especially relative to more important developments in Israel. Rabbi Gordimer: I will take this opportunity to thank you for your many efforts to expose the true colors of Open Orthodoxy (or, more accurately, “Outside Orthodoxy”). Ashrecha Shezachisa L’kach. Please do not let this threat of a lawsuit (frivolous, as I’m sure you know) diminish your voice. In my opinion, you are walking in the footsteps of Rav Hirsch, who exposed Zecharia Frenkel and the Breslau Seminary as non-maaminim in Torah min Hashamayim. The fruit of that ideology was the American Conservative movement. Open Orthodoxy appears to be headed in the same direction, and cutting them off before they further taint the observant community is vital. Cross-Currents Editors: If your forum only existed to publish Rabbi Gordimer’s articles, dayeinu–it’s creation would have been worthwhile, in my opinion. Chazak V’Emutz.